MUMBAI: Karsh Kale, the Indian-American composer/multi-instrumentalist is a one man orchestra. His sound is straightforward, energised and beyond common. Considered as one of the pioneering figures in defining the Asian Underground genre by mixing a range of different pieces of music, till date Karsh Kale has released seven albums, eight EPs and numerous collaborations with his name. He has had those moments in his earlier days when he didn’t know what he was going to do or wanted to do. We caught up with Karsh Kale during his last visit to India to talk about his creative process, musical dilemmas, the global fusion revolution he has been a part of, his thoughts on matters of identity in his music, his thoughts about the music progression of India, his persistency in the genre Asian Underground, and more. Radioandmusic.com wanted to know about his earlier days. Walking down the memory lane, Kale shared that he wanted to be a musician since childhood when he was three-four years old. "I knew I wanted to become a musician. For a while, I wanted to be a drummer and I played the drums insistently for eight hours in a day for ages. Then tabla came into my life, however, I was playing both in the same way. At a halt, I didn’t know what I was going to do or wanted to do. I feel incomplete if I am just doing one thing or playing just one instrument. I feel complete when I can jump from the tabla over to the keyboards, and that’s my world. I don’t just exist in classical world or this electronic or rock; broke those doors long ago." The 'visionary composer' doesn’t have a formula in that way when it is about creating sound. He said that he is mostly inspired by something he is going through. "Most of the music I put up on my albums are definitely kind of journals of moments in my life. Usually, it is the stuff that I hear in my head first and then I go and pursue it either on piano or keyboard, try and flesh out the idea. Sometimes it is a three-day process. Sometimes it is a two-year process. Time is the greatest luxury that a musician has," that's what he stated. “I am glad that it still exists. It is amazing to meet younger artists who are trying their own path and figuring their own sound within this pallet. For me, Asian Underground music is an identity; it is not only a sound, it is ever evolving sound," he put up in plain words. People who are not aware of the term Asian Underground and electric tabla, unfolding the layers of it, Kale described that it is absolutely based on electronic music. “It is all about mixing electronic music especially with classical and folk styles of music. Also, the rhythm aspects of tabla and pakhawaj, ghatam with the electronic element make it to Asian Underground. The marriage of the two not only created the sound but also created an identity for a lot of people,” he emphasized. While discussing the growing independent music outlook in India and the genre electronic and how he blends various elements and various styles in his sound, he said one needs to learn them. He refused to accept that one can sample a bunch of things and make tracks. "When you create something with so many layers, it’s because you are able to understand all those diverse sounds, languages. I have spent years playing classical music with several classical musicians, played the drums with rock bands, played as a DJ, remixed other peoples’ stuff. And, I often reference the musicians I work with, for example, how Zakir Bhai played this part as a tabla player? How Ajay Prasanna played the flute? I put all those experiences in my music." Also, he thinks an advanced understanding of numerous instruments is essential if one wants to 'go deep' into the music or wants to find something innovative, otherwise it won't last. "You do not necessarily have to be a virtuoso, but you have to understand the science of music. You have to understand the raags, how taal works so that you can break those rules when needed. But if you don’t know what the rules are, you are just kind of faffing around and trying sound till it sounds good," added Kale. Kale spoke about the youth who are inclined to electronic music and he strongly said that there are some incredible electronic sounds and music producers out there. "Unfortunately, that’s not what masses are listening to. And now there is a wave of EDM that is happening and in a way hurting this generation because they are not really exposing themselves to sophisticated music. It is true in Bollywood, pop music, true in anything that’s mass. EDM is pretty much same, the same scale and combination of notes. This is a gamer generation who have grown up with 8-bit sounds and I guess that is the formula. It builds up, it drops, and the bass coming in is a formulated thing and it is not my thing for sure," he said. However, he believes that some people are growing their musical knowledge and it has been like that always. "When I was younger, I kind of cut off from the mainstream. In NYC, I spent almost ten years in the underground music scene and I was surrounded by people who were doing stuff that wasn’t heard of before. Everything was new and people were reinventing their identities through music and trying new things and technologies, but it was not mainstream. So, once you start releasing music, then all of a sudden it is like you are competing in this world. And that’s when you start to realise, what is good and what is not. There are plenty of young artists who are incredible. I think everything comes in waves, so this wave will pass and the good stuff will remain." Kale said he doesn't have a favourite genre and if he is listening to any particular genre in a day, he would not definitely like to hear the same music the next day. He also added that in a day he can listen to a film soundtrack, he can listen to a classical record, then he can switch to Led Zeppelin album as well. "I guess that’s how people listen to music. Music is never background thing. It is always something that demands my attention. Whatever I am listening to, I am paying attention to it. If I need something emotionally, I know what kind of music I need to listen to," revealed Karsh. While talking about the approach of electronic music and the Independent music prospect in India, Karsh agreed to the fact that it has potential, definitely. "However, I won't say it is booming. The music scene in India is run by corporate sponsors. When you are generating a scene from the grassroots level, it is very hard. For example the first two editions of NH7, it was corporate sponsored but it was something new. That was revolutionary indeed." 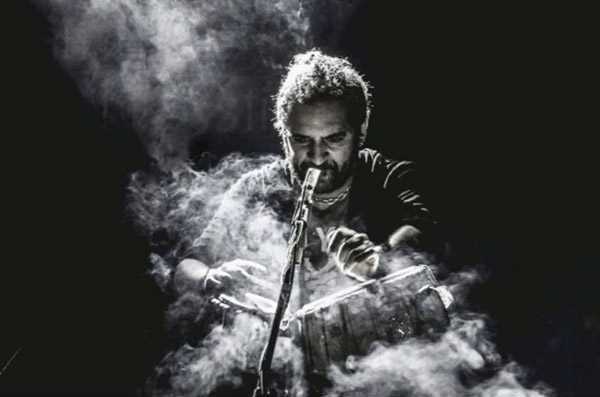 As he has performed all over the globe, speaking about it Karsh shared that NH7 and Burning Man Festival have been his top favourites, also Montreal International Jazz Festival and Glastonbury Festival. "Especially NH7 Weekender's first two editions. For me, it was a culmination of everything I had done to that point and I was doing the finale show. It was incredibly inspiring and still informative," told Karsh elatedly. He has collaborated, worked with renowned musicians from all over the world. Asking about his notable collaborations Karsh told us there are so many! He named Sting, Zakir Hussain, Ravi Shankar, Will Calhoun from Living Colour, Herbie Hancock, Pharoah Sanders, Norah Jones, Anoushka Shankar, Midival Punditz among others. "The greatest thing about working with these musicians is, I grew up listening to them and I have studied them. And, then all of a sudden, it is like becoming colleagues with your professor. I used to break dance to his music when I was a kid and then I was playing drums in his album (Herbie Hancock's Future 2 Future, 2001) years later. Norah Jones, Anoushka Shankar, Midival Punditz, these are the people I have been working closely and I am a big fan of all of their stuff as well. We are always influencing each other, pushing each other," said he. Discussing his upcoming projects Kale said he is working with Amaan Ali Bangash and Ayaan Ali Bangash for an album. Also, he is working with Delhi-based duo Shadow and Light, Komorebi, and Sarangi master Sabir Khan simultaneously. He is 50 per cent done with his upcoming project, which will release by the end of this year.